Where is your “happy place”? That place that is a retreat from the stresses of work or just life. That place where you can relax, refocus, and recharge (the 3 Rs). By definition, happiness is a state of well being and contentment. My definition of happiness: France. 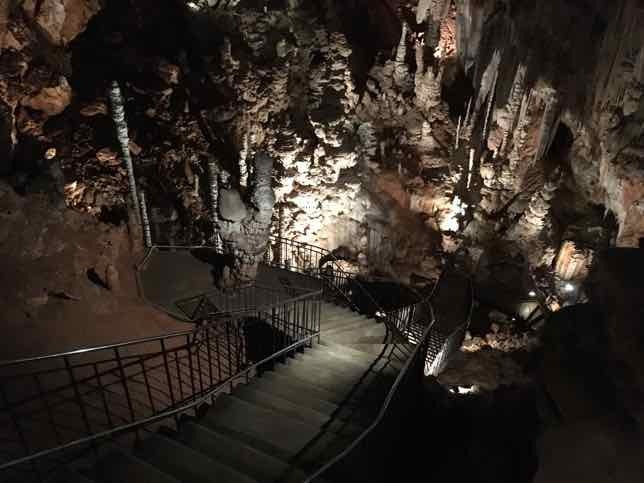 This week I share with you 4 places in France that have brought me great happiness and I suggest how you can find your own happy place in France. In 2010 and 2011, I attended the French language school, École des Trois Ponts, in Riorges, located about 85 kilometres north west of Lyon. I was there in October and April (perfect weather) and the rooms we stayed in surrounded a lovely courtyard that had many trees, lawn chairs, and a few tables. In the morning we would have classes and after lunch (with wine) some of us would congregate to the courtyard to do our homework or just relax. For the first time ever, I used the term, “bliss”. I actually used this term in an email to describe my feeling of contentment. I was firmly “in the moment”. 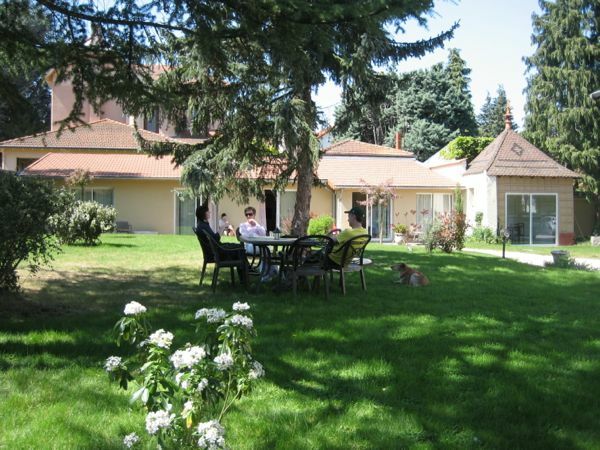 Sure, there are many courtyards and parks in the world where you can sit and relax, but there is something unique about working your tail off in French class in the morning, having wine at lunch, and then sitting outside in the most glorious weather…..and only speaking French. Happy Place Recommendation: go to France in September, October, April, or May and attend a French language school where you are fully immersed in the language—-speaking French at ALL times. It can be taxing on the brain, but when you are relaxing, you truly RELAX! Here’s my post on what it was like to attend École des Trois Ponts. In 2006 my friend Judy and I did a bike tour of Burgundy which is in central eastern France. Each day we would do about 50-60 kilometres through the countryside, stopping along the way for a picnic lunch or a tasting at a winery. 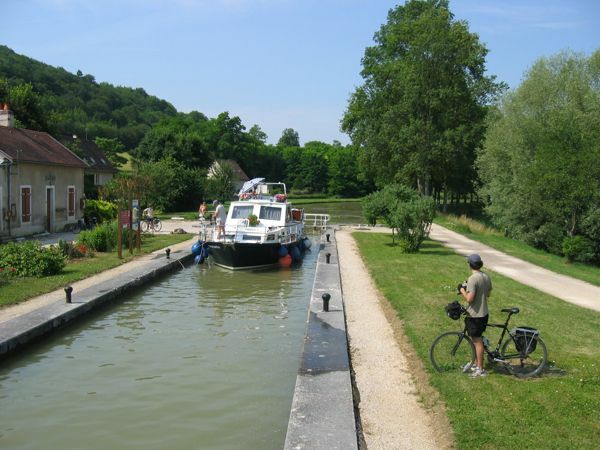 One of my fondest memories was biking along the Canal du Bourgogne which connects the Atlantic Ocean to the Mediterranean Sea via the Seine and Rhone rivers. This canal was constructed in 1775 and has 189 locks and today it is used primarily by tourist barges and pleasure crafts. What’s lovely about this journey is that the paths are primarily flat, so it’s an easy ride. It’s also very peaceful, which makes it the perfect “happy place” location. Once again I was “in the moment” as I breezed along the canal, thinking about nothing except what I would eat for lunch. When we stopped to watch the maneuvering of the lock, we were able to buy some ice cream at a small store right along the canal. Happy Place Recommendation: do a bicycle tour in France that uses side roads or bicycle-designated paths. The last thing you want to do is compete with cars and traffic. 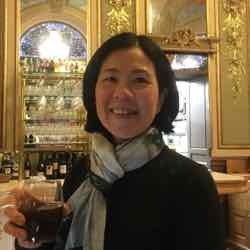 I’ve done bike tours in Burgundy, the Dordogne, and Bordeaux. My post, “What it’s like to take a bicycle trip in France” can fill in the details. Luxembourg Gardens is a favourite with many visitors due to its design, lovely flower beds, promenades, and big basin pond. On weekends it is busy with families bringing their children to the pond to rent toy sailboats, attend the puppet theatre, and run around in the playground. 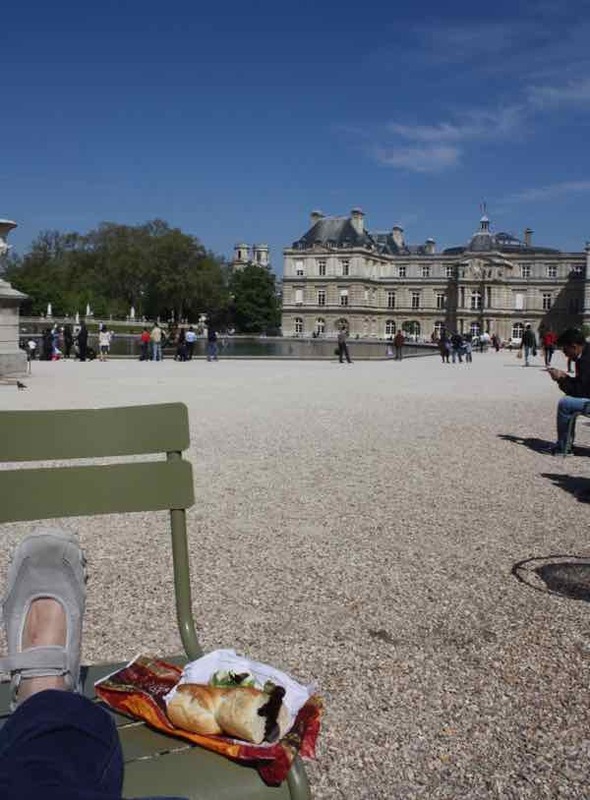 During the week it is very popular, particularly at lunch time as office workers bring their lunches and have a picnic (not on the grass). 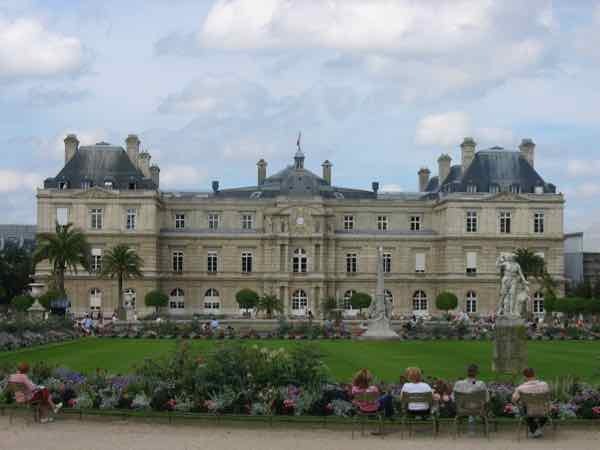 The gardens were created in 1612 by Marie de Medici, the widow of King Henry IV of France for her residence, Luxembourg Palace. In 1848 Louis-Philippe commissioned 100 statues for the 23 hectares area. They depict famous women and queens. Happy Place Recommendation #1: When I go there, I grab two green chairs (one to put my feet up) and sit either by the pond or up above on the first level terrace. I have on occasion brought along some snacks and wine. I’ve been careful to hide my wine as it is forbidden to drink alcoholic beverages in Paris parks. This is a beautiful location to people watch, read, or just meditate. My Happy Place Recommendation #2: I had to add another “experience” in Luxembourg gardens and that is to attend one of the free concerts which are held in the spring, summer, and fall at the kiosque à musique which is basically a bandshell where concerts the French or international groups are given. I attended on a Saturday afternoon in late September and the jazz band BB15 (a Paris jazz orchestra ) played for a couple of hours. The audience was seated on the famous green garden chairs and they surrounded the circular pavilion. 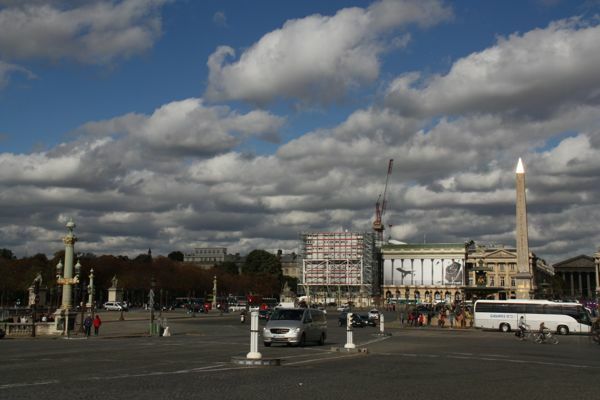 I grabbed at seat at the nearby café (Le Pavillion de la Fontain) and had a glass of wine. It was truly a relaxing, enjoyable experience. 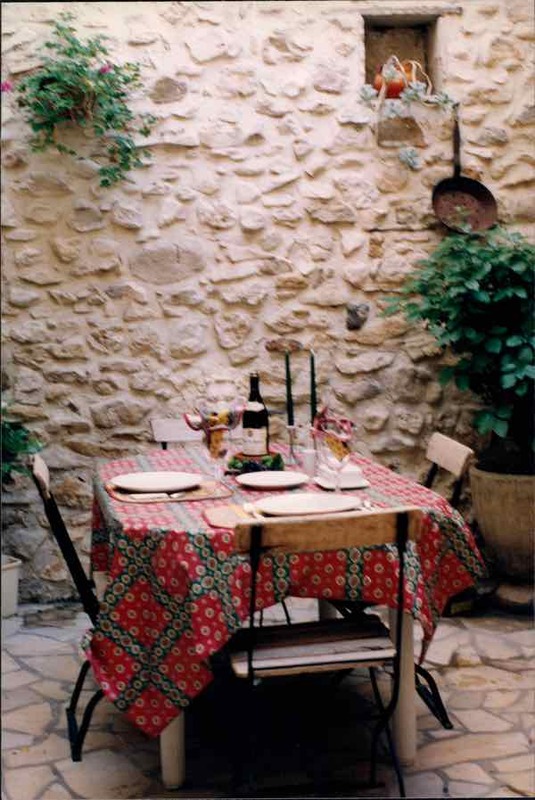 The first house I ever rented, with my friend Laurie, was in La Rouviere, west of Nimes in the Gard department of southern France. La Rouviere is a very small town (population around 600) and at the time it did not have any commercial businesses. A van would come in weekly to sell breads or meats and the nearest town, 3 kilometres away, was La Calmette. There were two features of the two-bedroom house that we absolutely loved. One was the courtyard that appeared when you opened the gate to the house. It had vine-covered walls and a large table in the centre where we often had dinner. It was an oasis within an oasis. The other highlight was the rooftop terrace. After a day of touring, or, on one of our days off, we would retire to the roof with some rosé wine relaxing on lawn chairs and looking down on the sleepy town. Must agree, it would be hard not to be happy in these beautiful surroundings. All of these places are gorgeous, Jan: sun, flowers, blue sky and tranquility are the perfect combination. Looks like finding your bliss as well as enjoying “living in the moment” wouldn’t be hard to do in any of these locations. 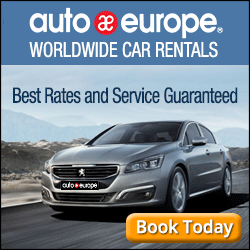 We have GOT to get to France and SOON! I hear you! I can’t wait to go back. 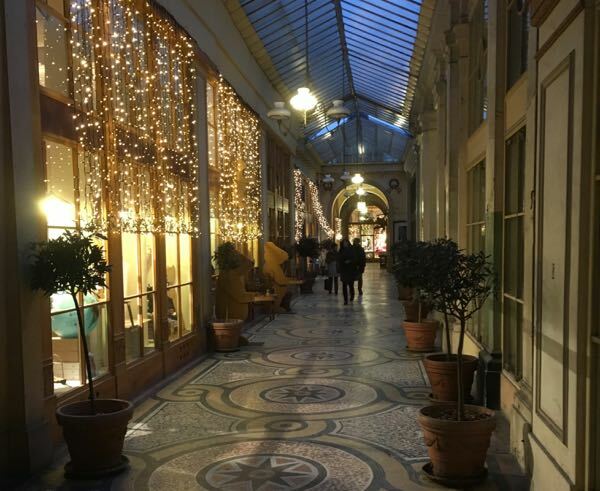 Love this roundup of French “happy places”, Jan. It was a treat to see that you’ve been to École des Trois Ponts for French+cooking. I spent a week there a few summers before you (when they were in an old chateau), and absolutely loved the experience. Food and wine certainly take the pain out of language learning 🙂 ! Cycling through Burgundy is still high on my bucket list, so I’ll run take a look at your post for more info about that. What I riot that you’ve been there too. I’m dying to go back. Love it there. Any of these would be a “happy place” for me although I think the ship might have sailed on my ability to learn another language. (Luckily, I became fairly fluent in Spanish by age 22. Otherwise, I’m pretty sure I’d be monolingual). My ancient photo on the TripAdvisor site is one of me and my husband looking very young at the Luxembourg Gardens in Paris. One is NEVER too old to learn another language! I’m so impressed you became fluent in Spanish. (Envious). If you could do that, you can do French! 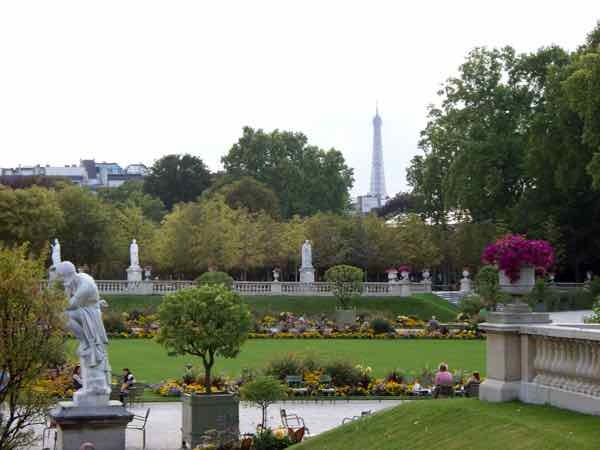 Those all look lovely, I love the Jardin du Luxembourg in spring time when I’ve been to Paris the past few times. 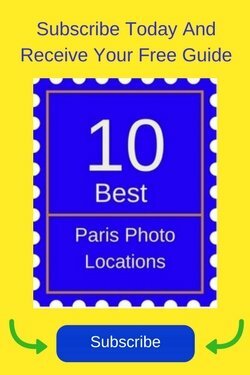 I would love to see the other locations, although I have been to Lyon central which is definitely one of my happy places. Lyon is lovely, but I’ve only been there once. I need to go back! I love the idea of cycling along next to the canals. Might put that on my bucket list. 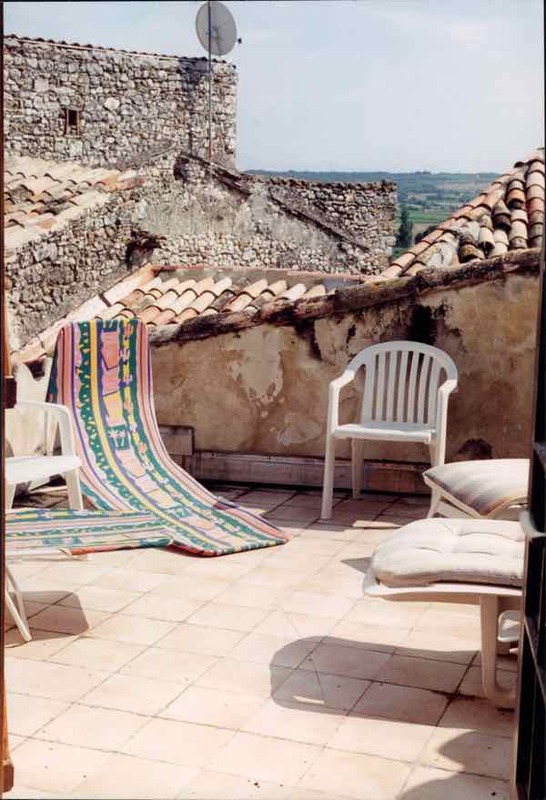 David and I several rented homes in France many years ago. Our children were little and so instead of hotels we rented holiday homes for a week and moved on Saturdays. It was a wonderful holiday and we felt we got to know so much more about each area than if we were just there a night or two. I try as much as possible to rent homes and nowadays you can rent for less than a week and/or start your rental period on days other than Saturday. You’re welcome. So true about slowing down. It’s hard, particularly when there are so many interesting places to see.